didnt you read the few recent posts ? Ulf3000 wrote: but the user above must share it to use on 57/58/59 .. I'm on 58.0b15 Developr Edition, haven't tested on Nightly 59.
ok that works too , you can also just copy the pref file from the xpi to firefox defaults folder then they are loaded on firefox restart ..
i dont think it will come the near future. 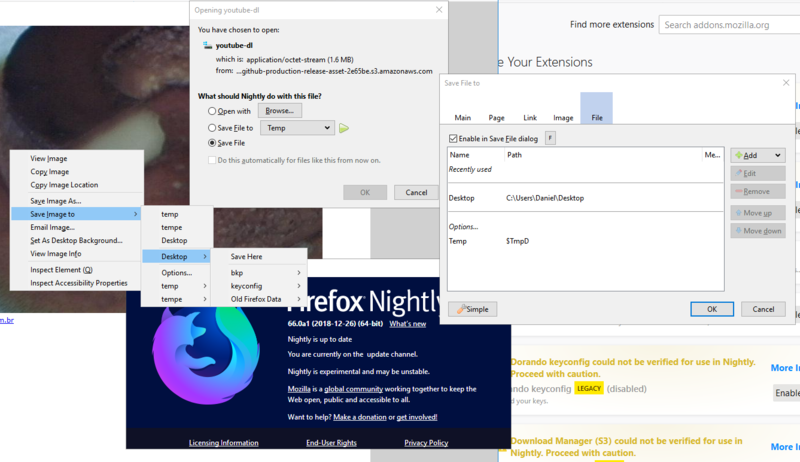 firefox downloads are limited to default (users download folder) or another chosen location where he has rights to save files. and to answer your other questions - same - it wont be possible to alter firefox internally pages or dialogs you like to. chose another extension instead - THAT is possible (eg "Elite Download Manager". i am not that tech savvy but i almost understood most of the items there. So with the release of firefox 64 dos this Addon Have to Still Remain dead now that we have context menu support ?